Guests at Shangri-La China World Summit Wing are spoilt for choices with regards to dining options in and around the hotel. Besides the six restaurants/bars at China World Summit Wing, offering different cuisine from Cantonese fine dining (Fook Lam Moon) to modern Japanese (Nadaman which specialises in kaiseki cuisine; teppanyaki, sushi are also available), the China World Shopping Complex also hosts a myriad of restaurants and cafes catering to different budgets and tastes. 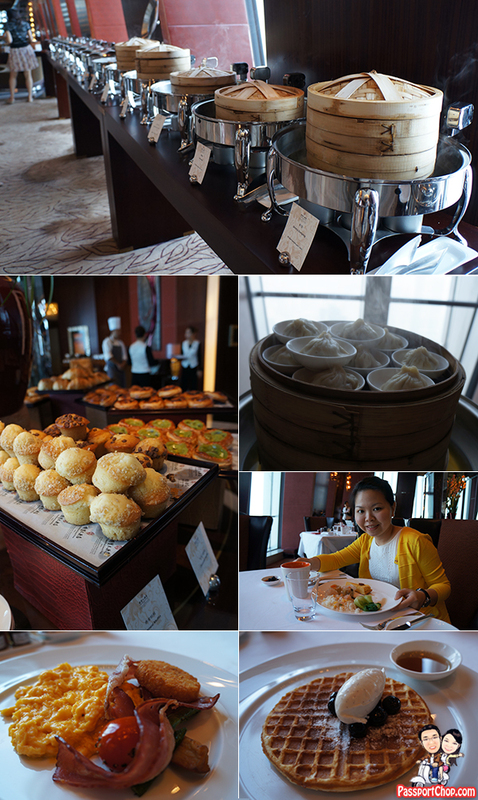 Breakfast for China World Summit Wing guests is served daily from 6.30am to 10.30am daily at Grill 79 on the 79th floor of China World Summit Wing – you can expect a sumptuous buffet selection with both international and continental options e.g. dim sum, cold cuts, sushi, sausages – you name it they have it! The assorted bread selection was just as amazing with all kinds of croissant, sandwiches etc. On top of all these, guests can also order cook-to-order dishes from a 2-page menu from the savory– e.g. free range eggs (fried, poached or scrambled style), eggs benedict, la mien noodle soup to sweet – e.g. waffles, pancakes, traditional english porridge, to complement the buffet breakfast. With this sumptuous breakfast buffet spread, you might forget to check out the views of Beijing city from the floor-to-ceiling windows of Grill 79 – on a clear day, you can see all the way to the Forbidden City! If you missed the morning view, you can still drop by Grill 79 for lunch (available from 12noon to 2pm daily). As the name of the restaurant suggests, Grill 79 is well-known for its grilled dishes be it beef, lamb, seafood or even vegetables. Dining at Grill 79 during lunch can be relatively affordable way to try out the fresh ingredients and unique cooking styles of the Grill 79 chefs. I tried out the Grill 79 Two Course Set Lunch Menu (RMB 180; top up an additional RMB 35 for a Three Course Lunch) which offers quite a good selection of appetiser and main courses dishes. Our dining experience started on a high note right from the pre-meal bread basket with warm bread rolls and an interesting trio of flavored butter – seaweed, tomato and (I can’t remember the green one). The warm bread roll and all the butter tasted awesome together and they were very addictive – had to stop ourselves to make space for our main courses! I strongly recommend the Lobster Bisque – Pan-fried blue lobster, smoked paprika and tarragon-infused oil (RMB 260) as an appetiser to your meal – it tasted yummy and like the bread and butter mix, very addictive. The ingredients were very fresh and soup very flavorful! Do note that this Lobster Bisque dish is not available as an option in the Two Course Set Lunch Menu. For my Grill 79 Two Course Lunch Set, I chose for appetiser, the Seared Scallop Salad – Sea Urchin with Endive, Green Avocado Salad and Lobster Vinaigrette and for main course, the Cajun Spiced Chicken – Handmade Pasta with Okra and Andouille Sausage. I enjoyed both dishes especially the fresh scallops. The Cajun Spiced Chicken pasta was a very filling dish and has a strong taste (likely from the cajun spices) – generally quite spicy and salty (perhaps due to the smoked Andouille Sausage). The Grilled Black Tiger Prawn (8 Pieces for RMB 395) was very fresh and grilled to perfection where the surface was crispy and the meat kept tender. Complement this grilled dish with some side dishes e.g. Hand Cut Chips with Smoked Mayonnaise and Roasted Garlic (RMB 82) and Sauteed Button Mushroom with Rosemary and Tomato (RMB 82) and you have a great and fulfilling meal at Grill 79! The Hand Cut Chips were awesome and unlike any French Fries I have tried – crispy and savory (due to the spices cooked with it) and you can eat it on its own without any sauces (though eating them with mayonnaise is also good)! 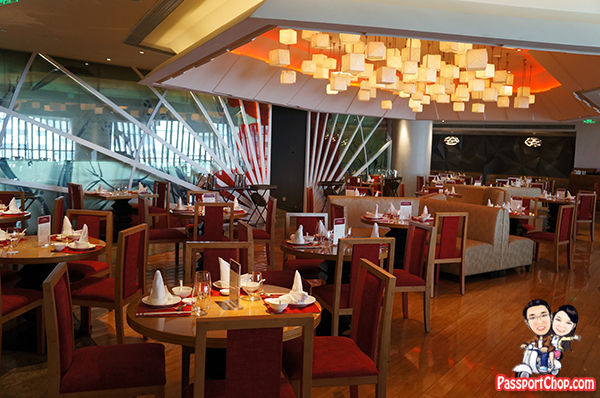 Located on Level 4 of China World Summit Wing, The Red Chamber is a contemporary restaurant specialising in the regional cuisines of Guangdong, Huaiyang, Sichuan and Beijing. The Red Chamber is open for lunch daily from 11.30am to 2.30pm and dinner daily from 6pm to 10pm. 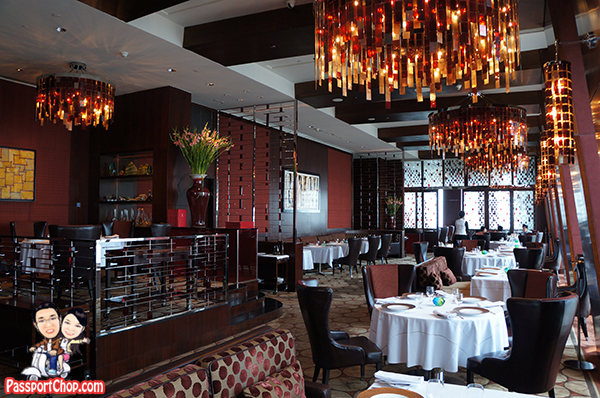 Unlike the Shangri-la’s Shang Palace, the Red Chamber offers a casual dining experience amidst elegant restaurant decor and you can expect the same high level of service from the Red Chamber staff too. An adjoining noodle bar offer a wide range of excellent hand-made Shanxi noodles for a more casual dining experience. If you want to try the authentic 老北京炸酱面, you can order The Red Chamber Special Hand Made Pork Meat Noodle with Soy Bean Sauce (RMB 45). Lao Beijing Zhajiangmian (literally translated as Old Beijing Fried Sauce Noodles) is a Chinese dish consisting of thick wheat noodles topped with a mixture of ground pork stir-fried with Zhajiang (炸酱面) which is salty fermented soybean paste. I strongly recommend the Clear Mushroom Soup 养生菌皇汤 (RMB 30) at The Red Chamber where different types of mushrooms are boiled with herbs to create this soup. 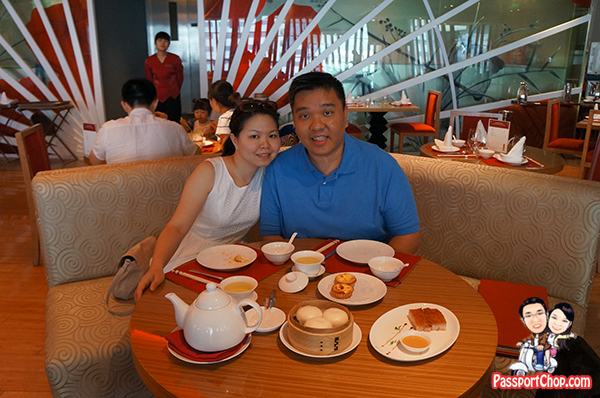 We opted for a number of 小吃 light snacks dim sum to complement the above 2 dishes e.g. Baked Portuguese Egg Tarts (3 Pieces) (RMB 26), Fried Shrimp Patties (RMB 62). If you are a fan of roasted pork 烧肉, then you must order the Crispy Pork Belly 冰烧三层肉 (RMB 72) – very crispy with very soft meat (that almost melts in your mouth!). Well I shall stop writing here – salivating over these dishes as I write! I will leave you with a picture of two very satisfied customers of The Red Chamber and Grill 79 at China World Summit Wing. Having the fantastic health and financial resources to travel with my wife as much as possible, to see more on the globe and meet more of its people.